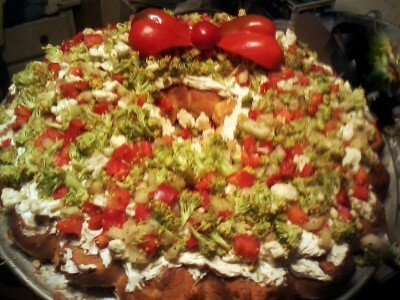 Here's a unique twist on that old 'Veggie Pizza' I presume we've all had – there are hundreds out there... 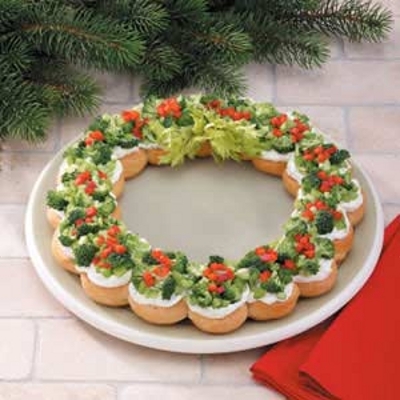 Using packaged crescent rolls, instead of spreading them out flat you slice them into discs – genius! The recipe then uses a base made of your very own herbed cream cheese and sour cream (feel free to mix up the flavor combination to YOUR choosing), and then you top with a variety of chopped vegetables. I LOVE the idea of using celery leaves as the bow!!! Simple, easy – you can do all your prep work the day ahead (slice and bake the dough, blend your cream cheese, chop the veggies) – but I'd recommend not assembling until the day you intend to serve, or it could get soggy. Note from December 2013: I multiplied this for my workplace Christmas party. 5 tubes rolls, 3 times the spread (added powdered onion, lemon zest, and white pepper, PLUS the originals), a touch of cauliflower, and as my celery leaves looked "eh", opted for a red bell pepper bow!